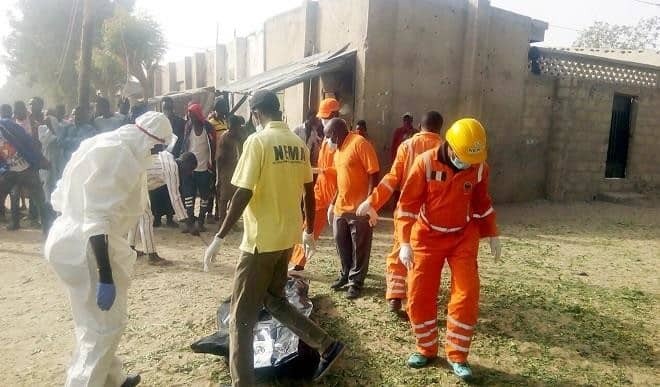 Three female suicide bombers lost their lives on Wednesday night in a failed attack on a military outpost popularly known as ‘Guantanamo’ along Muna garage, Maiduguri. Abdulkadir Ibrahim, spokesperson of the National Emergency Management Authority (NEMA), in a statement, said security operatives killed the three teenagers. He noted that a security officer was however injured in the attempt to intercept the attackers. “Yesterday (Wednesday) night 3/5/2017, at 10:05 pm, three female teenage suicide bombers attempted to attack military outpost popularly known as “Guantanamo” along Muna garage,” he said. He said the corpses of the would-be bombers have been evacuated to Borno state specialist hospital, Maiduguri.